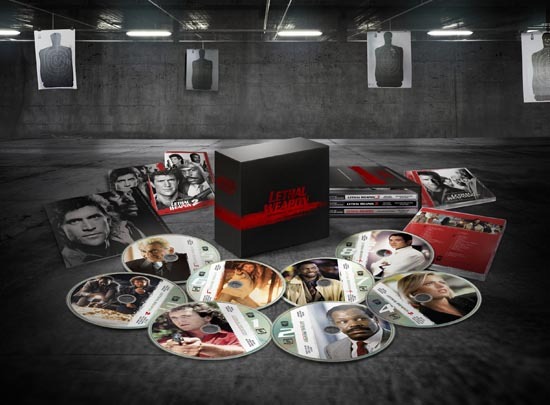 La-La Land Records, Warner Bros. and WEA celebrate Warner Bros.' 90th Anniversary, with the LETHAL WEAPON SOUNDTRACK COLLECTION - an 8-CD BOX SET featuring Michael Kamen, Eric Clapton, and David Sanborn's iconic film scores from all four LETHAL WEAPON films. Each LETHAL WEAPON score is contained in its own 2-CD jewel case, and all four scores, along with a 40-Page booklet, are housed in an attractive slip case. Finally, some of the greatest action film music ever composed — from the most celebrated cop-action saga of all time — is presented here in a deluxe presentation worthy of their legacy. The scores to LETHAL WEAPON 1-3 have been greatly expanded beyond their original soundtrack album presentations (the original soundtrack assemblies are remastered and presented as well.) and the score from LETHAL WEAPON 4 makes its world premiere with this set. A bounty of previously unreleased score music is featured here, literally hours worth, along with bonus score tracks and knockout songs from the likes of Sting, Elton John, George Harrison, The Beach Boys and more — not to mention the Bobby Helms rendition of "Jingle Bell Rock," which opens the original LETHAL WEAPON! Produced by Neil S. Bulk and MV Gerhard and mastered by James Nelson from WB vault materials, this amazing release, limited to 3000 Units, features a 40 Page booklet with exclusive liners by film music writer Jeff Bond, with new comments from director Richard Donner, and explosive art design by Jim Titus. Once you dig into this sensational set, we know you'll agree with us when it comes to Michael Kamen and LETHAL WEAPON, you'll never get "too old for this sh#*!"